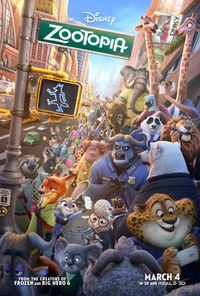 Zootopia</ref>}} is a 2016 American 3D computer-animated buddy cop comedy film produced by Walt Disney Animation Studios and released by Walt Disney Pictures. It is the 55th Disney animated feature film. It was directed by Byron Howard and Rich Moore, co-directed by Jared Bush, and stars the voices of Ginnifer Goodwin, Jason Bateman, Idris Elba, Jenny Slate, Nate Torrence, Bonnie Hunt, Don Lake, Tommy Chong, J. K. Simmons, Octavia Spencer, Alan Tudyk, and Shakira. It details the unlikely partnership between a rabbit police officer and a red fox con artist, as they uncover a conspiracy involving the disappearance of savage predator inhabitants of a mammalian metropolis. Zootopia premiered at the Brussels Animation Film Festival in Belgium on February 13, 2016, and went into general theatrical release in conventional 2D, Disney Digital 3-D, RealD 3D, and IMAX 3D formats in the United States on March 4. Critics praised its screenplay, animation, voice acting, and subject matter. It opened to record-breaking box offices in several countries, and earned a worldwide gross of over $1billion, making it the fourth-highest-grossing film of 2016, the 34th-highest-grossing film of all time, the fourth animated film to pass $1billion in global box-office earnings, and Walt Disney Animation Studios' highest-grossing film since 2013's Frozen. It earned numerous accolades, and received an Academy Award, Golden Globe, Critics' Choice Movie Award, and Annie Award for Best Animated Feature Film, as well as receiving a nomination for the BAFTA Award for Best Animated Film. This webpage uses material from the Wikipedia article "Zootopia" and is licensed under the GNU Free Documentation License. Reality TV World is not responsible for any errors or omissions the Wikipedia article may contain.